As soon as you start up a new Android phone, you get prompted to sign in with your Google account—but what if you don’t want to do that? Maybe you want to take advantage of Android but limit what Google knows about you, or maybe you just prefer the alternative apps; whatever the case, here’s how to live a Google-free Android life. Right from the start we’ll be honest and say it’s not easy using Android without Google—but it is possible. If you want a more convenient life, then you need to sign right in when prompted. The big miss if you don’t is the Google Play Store, but here we’ll show you how to get around that and various other obstacles along the way. We’re assuming you’re starting with a brand new Android phone fresh from the factory. You can de-Google-ify an existing Android handset, but you’ll need to reset it first through the Settings app, to get back to the original setup screen. That means all your existing apps and data get wiped, so you’ll need backups of all your important stuff somewhere. Welcome to your new (or factory reset) Android phone! The prompt to sign in with Google arrives about five screens in, after you’ve chosen your language and connected up to wifi. When you’re prompted to sign in, hit Skip instead, then hit Skip again to confirm that yes, you really do want to use Android without a Google account. A couple of screens later, Google very kindly asks if you want to opt in to some extra Google services: Location tracking and system diagnostic reports. If you’re not happy with either or both of these options, turn the relevant toggle switches off, then hit Agree to continue (you can’t use a phone with regular Google-provided Android on it without agreeing to some basic terms and conditions). And... you should then be in. Don’t worry if you see a few Google apps, because they won’t be connected to anything—Google Photos, for example, can work as a local image library manager without actually connecting to the cloud or a Google account. If there are any apps you want to get rid of, long-press on their icon and drag the icon up to the Uninstall link at the top. YouTube works perfectly well without a Google account to sign into, though you obviously don’t get access to any personalized apps or any of your playlists. Google Maps is another app that will work without a Google account if it’s pre-installed, though again you don’t get all the personal customizations. It’s important to note that a Google account handles various aspects of syncing and backing up Android as well, and you’re going to have to hunt around for alternative solutions. You won’t get Google Contacts synced over, for example—fine if you don’t want to use Google Contacts, but you’ll need to get something else in place or build up your contacts list from scratch on the phone itself. And these apps will still want to log data and information about you, even if Google doesn’t. As always, you can manage the permissions an app has (and the data it can therefore collect), up to a point—head to Settings and tap Apps & notifications, then App permissions to see a list and make any changes you deem necessary. The big miss if you don’t connect your Android phone to your Google account is the Google Play Store: Try and load up the Play Store app and you’ll just be met with the sign in screen again. To get around this, you need to start sideloading apps through your Android phone’s web browser. In times gone by you would need to authorize “unknown” apps (not from the Play Store) in Settings, but modern versions of Android ask for authorization on an app-by-app basis. You’ve got two choices here: Either embrace the Amazon App Store, which isn’t as comprehensive as Google’s but has most of the big-name apps, or transfer apps over one by one as you need them from the excellent APKMirror repository. Choose the former for an easier life (including automatic updates for your apps), or the latter for more control over your phone. If you’re taking the Amazon route, go to www.amazon.com/androidapp on your phone and follow the instructions on screen—you will have to confirm that you are ready to risk installing apps downloaded outside the Play Store, and tap through a couple of security warnings along the way. With that done, sign in with your Amazon account, and away you go. You get a lot of the major apps (Netflix, Spotify, Facebook, Instagram), though there are some omissions too (Snapchat, YouTube). Google’s apps are nowhere to be seen, but that’s the whole point of this exercise, isn’t it? The Amazon App Store doesn’t have the polish of its Google counterpart but it will keep everything updated and sorted for you. You can install apps straight from APKMirror instead of, or as well as, from the Amazon App Store. Head to the site in your browser, or download files on your computer and transfer them over through your file syncing tool of choice or via a USB cable. Again, you’ll need to tap through a series of security warnings as you install apps, but APKMirror is a reputable source (just don’t install anything too esoteric, just to be sure). APKMirror is likely to have most of the apps you need, though—as with the Amazon App Store—some of the latest games titles might be missing. You also can’t download any apps that cost money—these are strictly free apps. The other disadvantage is that your apps don’t auto-update, so you need to remember to do this manually on a semi-regular basis (APKUpdater is a decent effort at automating this process for Android versions up to 7.1). As you’re probably aware, you’ve got all kinds of alternative options for replacing Google apps: Outlook instead of Gmail, Firefox instead of Chrome, OneDrive instead of Google Drive, Flickr instead of Google Photos, MapQuest instead of Google Maps, DuckDuckGo instead of Google search and so on. To really rub salt into Google’s wounds, you could even try Apple Music. You might also have some alternative options from whichever company made your Android phone. Manufacturers like Samsung and OnePlus have some very competent apps for handling the basics of phone use that you can deploy instead of Google’s own apps (including, possibly, an app for managing your contacts). You can tailor your approach to be more or less anti-Google, as you feel necessary. If you don’t want the hassle of an alternative app store, you can sign into the Play Store and get all the apps you need, without touching Google’s native apps like Gmail or Google Maps. As a result you’ll be giving Google a bit more information about yourself and about how you’re using your device, but you might consider the trade-off worth it for the extra convenience. 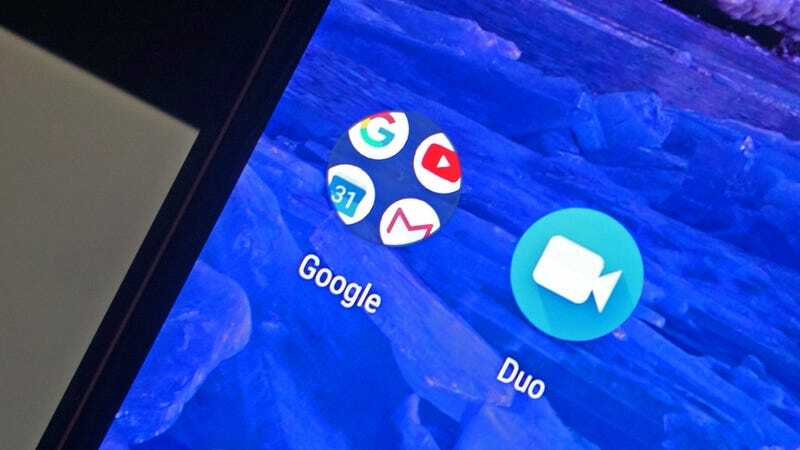 Maybe install the Microsoft Launcher from the Google Play Store as an easy way of avoiding Google’s native apps and search, then stick to the non-Google apps we’ve already listed above. Alternatively you could go full-on anti-Google and install an entirely new version of Android—something like LineageOS. You’re going to need a device that works with the custom ROM, and the patience and know-how to flash it, but you’ll be left with a completely Google-free phone at the end of the process. Bear in mind that if you flash an alternative OS on your phone, you won’t have access to Google Play Services, which many popular and well-known apps rely on to work—especially when location access is required. You can add this on top of LineageOS, but that sort of defeats the process of installing a separate mobile operating system in the first place. The open source app store F-Droid (above) covers an impressive number of bases, and features apps you can use free of Google influence (including Google Play Services), but you’re also going to have to do without big-hitters such as Facebook, Spotify, Netflix and so on. Fine for those who yearn for the days of feature phones, not so great for the rest of us. It really depends on how much time and effort you want to invest and how little Google you want in your life, but you should find something that works for you. Ultimately you can get Android running with little or no Google influence—though perhaps not as easily as some EU regulators would like.